Whether you're a complete beginner, business owner or marketing professional looking to upskill, this digital marketing program is perfect for you. The Certified Digital Marketing Professional course will introduce you to the key digital marketing specialisms, from mobile and social media to email, PPC marketing and SEO. Spread the cost! Ask us about our flexible payment plans. Join over 32,500 members in over 100 countries! Digital technologies have changed the way we work, live and communicate. That’s why we have designed a professional certification that can make a real difference. This certification will provide you with an in-depth understanding of how to effectively strategize and implement powerful digital marketing campaigns that convert. From social media marketing to search marketing, you’ll learn everything you need to excel at your digital marketing career. Who is this Professional Certification for? What competencies will you gain? Understand the key concepts of digital, how it has changed customer behavior and the implications for your role and the wider business. Achieve business goals by understanding how to devise, implement and measure digital campaigns that engage and convert. Understand the importance of digital channels and strategies and know how to use SEO, paid search, content, advertising and email to drive customer engagement. Becoming a Certified Digital Marketing Professional will provide you with an in-depth understanding of how to strategize and implement effective digital marketing campaigns. Your certification in digital marketing will give you an in-depth understanding of how to effectively strategize and implement powerful campaigns that convert. From social media marketing to search marketing, you’ll learn everything you need to excel at your digital marketing career. The Digital Marketing Foundations module will introduce you to conducting digital research, setting business objectives for a digital campaign and preparing the foundations for developing a targeted marketing strategy. The Website Optimization module will explore how to build and publish a well-designed, high-performing and optimized website that is aligned to your business goals. You will use the key components of web design to design, create and publish an effective website and choose the most suitable hosting option based on budget and business goals. The Social Media Marketing module enables you to apply social media concepts and best practices to organic and paid marketing activities to run campaigns that yield ROI and meet business objectives. The Search Engine Optimization (SEO) module will enable you to build an organic search marketing strategy that brings the right kind of visitors to your website. It will help you understand how to boost conversions, stand out against competitors and ensure the best possible ROI. This module will enable you to achieve or exceed business goals by adopting a digital mindset.It will ensure you recognize the importance and value of a digital-first approach and learn how it brings agility to the business. You will understand S.M.A.R.T (Specific, Measurable, Achievable, Relevant, Timely) business goals and the importance of Key Performance Indicators (KPIs). The Display & Video Advertising module will equip you with the technical understanding and skills to build and maintain an effective Display & Video advertising strategy. The Analytics module will help you understand the basic concepts of using analytics in digital marketing from initial set-up to reporting. You will be able to recognize the fundamentals of web analytics to draw actionable conclusions from data and create a Google Analytics account to glean insights about traffic and audiences. Become a Certified Digital Marketing Professional on completing this exam. HD video lectures with accompanying downloadable course material. Resources to help you with your studies including self-directed practical exercises and recommended reading. An extensive content library how you need it, when you need it. Our suite of certifications enables professionals - at all stages of their career - to progress from Associate to Master to learn relevant and industry aligned skills that can be applied to any role to drive career success. Our specialist product team work closely with leading industry experts to create, review and update the learning outcomes on a regular basis. Our certifications, developed in conjunction with industry giants and world-class practitioners, have helped a generation of professionals advance their careers. Who should take this digital marketing course? Anyone can apply for the digital marketing professional certification. A background in a related discipline is not required; the aim of the Certified Digital Marketing Professional course is to enable you to learn everything you need to know at a foundation level, so you can kick start your digital career. You could be a business owner, a traditional or digital marketing professional, a recent graduate, or simply looking to change your career. Upon successful completion, you will become a Certified Digital Marketing Professional. How much does this digital marketing course cost? The Digital Marketing Professional Certification costs to study online. This includes all course materials and the examination fee (first attempt only). How long is this digital marketing course? The digital marketing diploma is approximately 30-hours of digital marketing course content. The professional diploma in digital marketing is delivered online. You can access your digital marketing course content wherever and whenever you want. How is the digital marketing certificate assessed? This Digital Marketing Certification is assessed by one three hour exam; these are administered by our computer-based testing partner, Pearson Vue, via its global network of test centers. The exam is split into three sections; candidates need to achieve a minimum of 60% to pass the exam. Your examination fee is included in the price but subsequent re-sits due to failed attempts will incur a fee of approximately €60 or local currency equivalent payable directly to Pearson Vue when you book your repeat attempt. Where will my qualification be recognized? The Digital Marketing Institute is the global certification body for Digital Marketing education. 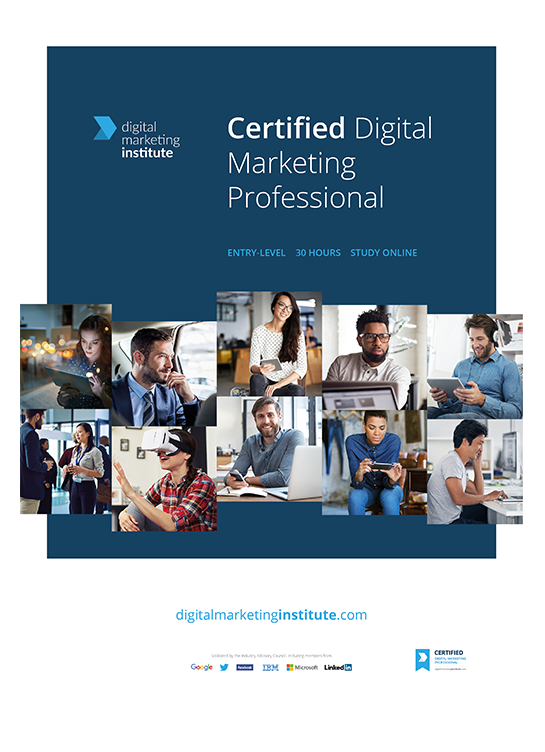 Exclusively designed by practising Digital Marketing professionals, the Certified Digital Marketing Professional carries the coveted Digital Marketing Institute accreditation and associated brand recognition, which is highly sought after by employers. Upon successful completion of the Certified Digital Marketing Professional, you will become a Digital Marketing Professional. The Certified Digital Marketing Professional Course has been credit rated. Is this digital marketing course technical? No, in the sense that it is not a programming course, and you will not have to learn any coding. The Certified Digital Marketing Professional Course focuses on the commercial aspect of online marketing. The Certified Digital Marketing Professional (CDMP) is a practical course designed to help you improve your business's online lead generation and customer engagement. Boost your credibility and advance your knowledge, role and career.